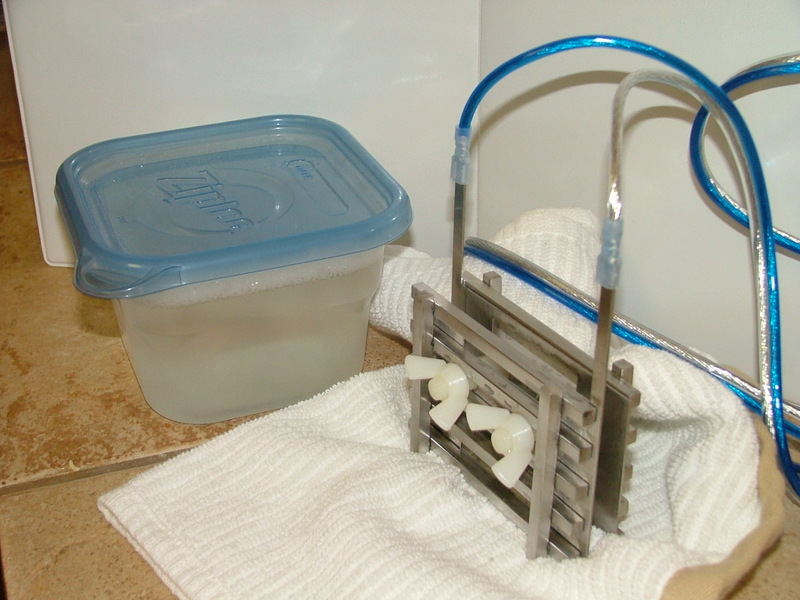 “The reason cleaning is so important, is that our machine pulls a lot of acid from the body. During the session, that acid becomes baked on the array plates. If it is not removed through proper cleaning, it will oxidize the stainless steel as the array sits in the air between sessions and your array will not last as long as it should..
For demonstration purposes, we are using a new array. You will probably want to rinse your array in tap water before cleaning. The detox residue material in the foot bath WILL stain carpet, and is likely to make linoleum or tile flooring VERY slippery! You may also want to wrap the array (steel portion only) in an old rag to prevent drips. You can use the same rag you used to wipe off your feet after a treatment, if you’d like. 1. You will need a reusable food storage container with lid (approximately 40 oz.- ours is 32 oz. ), deep enough to submerge the array itself and a bottle of mineral/lime removing cleaner (approximately 15-20 oz. will be needed). We recommend CLR or Lime-Away, as it is easy to find. It will be in the household cleaning products section or any grocery store, drug store, or all-in-one store (such as Target, Walmart, K-Mart, Zeller’s, etc). If you live in a country (such as Australia) where CLR cannot be found, use a cleaning product formulated for removing mineral build-ups and rust from metal. 2. Fill your container about halfway with your cleaner. 3. Fill the rest of the container with water (tap water is fine!) You want a 50/50 mixture. 5. If needed, add more water until the top of the steel bars are submerged, adjust solution amount as necessary. Let the array soak in this solution for about 10 minutes. 6. Rinse the array in tap water, dry it off thoroughly and put the lid on your food container, for future use. 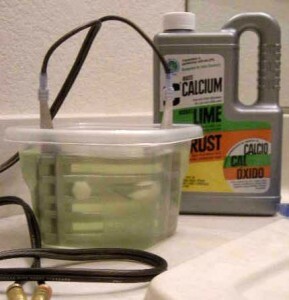 You can reuse the same cleaning solution over and over again! Your array is clean, and ready to go for your next treatment! For future cleanings, you need only repeat steps 4-6. Best Wishes and Great Health!